How do you demonstrate to management that environmental, health and safety (EHS) activities are adding value to the business? It's a question being asked frequently by EHS managers who are under tremendous pressure during these tight economic times. Developing an EHS strategy that is in lockstep with the business strategy is essential. This month, Manager's Notebook examines some of the key steps to accomplish this union of purpose. frustrating corporations even today.1 Beginning in the mid-1970s, a series of changes took place that triggered a fundamental shift in the philosophy of the audit profession. In order to cut costs and at the same time provide protection against litigation, accountants lobbied for "precise, almost mechanical accounting standards." The standardized approach "enabled auditors to abdicate their primary responsibility as processors of information." In other words, they were unerringly following the rules and ignoring the big picture. EHS professionals may be caught up in a similar situation. EHS regulations, particularly those in the United States, can be very prescriptive. The question from management becomes, "Are we in compliance with the regulations?" and not "Are we acting as a responsible corporate citizen and are we improving the company's competitive position?" Indeed, many EHS professionals have told me that their business managers have unequivocally stated that letter-of-the-law compliance is the prime determinant of corporate EHS responsibility. Some business managers claim that compliance represents EHS excellence. I'm not making this up! This peculiar perspective ignores history: most companies that are considered irresponsible today violated no laws at the time of their questionable activities. When regulations and procedures take precedent, strategy becomes unnecessary and value is elusive. When regulations and procedures take precedent, strategy becomes unnecessary and value is elusive. For example, if the need for EHS management systems is driven solely by the need to enter markets and not by a desire to improve performance, business managers may only be concerned with passing muster with the certifier. The larger responsibilities to society, or even competitive opportunities, are overlooked. In this myopic business world of rules and regulations, the focus is on cost cutting, and rightfully so because that is precisely how executives handle administrative tasks. Human resources and data processing functions have many of these transaction services characteristics. Not surprisingly, business-process outsourcing (BPO) is becoming very much in vogue, but shouldn't EHS be able to offer much, much more value? Absolutely, but only if a clear strategy defines, communicates and delivers this value. The value that a company creates is measured by the amount that buyers are willing to pay for a product or service. A business is profitable read competitive if the value it creates exceeds the cost of performing the "value activities." This is the textbook definition of value.2 Successful companies grow and generate profit, of course, but what are the factors that contribute to their success? Two extensive research programs recently investigated this question by examining the historical performance of hundreds of companies. These studies are compelling because they are based on real-world data, not some convoluted business model or cases studies of a few successful companies. The first study was conducted by a team led by Jim Collins and published in the book Good to Great.3 It describes how mediocre companies went from so-so performance to fifteen years of sustained excellence. Only eleven companies (out of 1,453 companies examined) made the minimum cut point of cumulative stock returns at least three times the market. This threshold was selected because it exceeded the performance of the most widely acknowledged great companies from 1985 to 2000. All eleven companies were found to have the same seven key characteristics. The initial intent of Professor Nohria was to examine 200 well-established management practices and determine which ones work best. Instead, the team found that these management tools and techniques had no direct causal relationship to superior business performance as measured by total shareholder return. What does matter are eight primary management practices, the first four of which must be present, with at least two of the next four also present. Figure 1 lists, in order of priority, the success elements identified in both studies. Explaining the nuances of each element would require far more space than this article provides. There are, however, two key points that can be quickly ascertained from the comparison presented in Figure 1. First, there are direct comparisons between both studies. In other words, the findings are consistent and reinforce the validity of both studies. The single word comparison in Figure 1 is admittedly cryptic, but if one references the source material (which I urge the reader to do) the connections become apparent. Second, strategy as a value contributor is listed at the very top in both studies. Strategy is defined as identifying (and clearly articulating to employees): (1) where the company is headed; (2) the critical market factors that will affect the company; and (3) "the best path to greatness." It is not some bold new course of action such as one championed by a newly hired "hero CEO." It is a carefully reasoned and focused approach to drive the company forward. Strategy is probably one of the most overused terms among EHS professionals. A Google search for the precise phrase "environmental strategy" will yield 50,600 hits. It is especially popular among consultants such as myself (a word of caution: we charge extra when we use impressive-sounding terms). The truth is that corporations with a well-developed EHS strategy are very rare. Those few companies with a cohesive strategy achieve remarkable value, not to mention international recognition. They include: DuPont's safety strategy (an unquestioned core value); 3M's pollution prevention focus (innovation and cost reduction); Baxter International's strategy for metrics and cost accounting (cost reduction and medical product trust); Bristol Myers Squibb's reporting strategy (transparency and pharmaceutical product trust); Dow's global EHS standards (reputation and acquisition integration); and Intel's supply chain and design for excellence strategy (reliability, trust and innovation). There are other companies, but considering the thousands across this globe, competitive EHS strategies are the exception, not the rule -- in spite of all the corporate spin. An EHS strategy is successful only when it is strongly linked to the business strategy and objectives (as noted in parentheses in the previous paragraph). In most companies there is no such link, other than the usually expressed business goals of cost cutting, image protection, compliance and risk reduction. Business managers in essentially every company profess these same objectives and thus, the so-called strategy loses all competitive significance. Many companies have public statements that identify environment, health and or safety as a "core value." These statements are not competitive strategies; nor do they clearly define business value in actionable terms (i.e., sufficient to justify resources). They are public and employee relations positioning statements. Sadly, I am familiar with far too many companies that talk of EHS as a core value, but their EHS staffs are run ragged and under constant threat of cutbacks. Those few companies with a cohesive strategy achieve remarkable value. To read the pages of magazines such as green@work, one would think that companies are engaging in synergistic deployment of continuous competitive enhancement at an ever-accelerating pace or some such razzle-dazzle. Not so. The mainstream reality is that the vast majority of EHS troopers at the front lines are struggling just to maintain regulatory compliance and possibly a few "beyond compliance" programs. 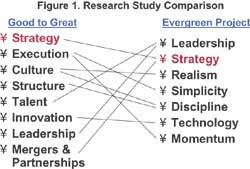 The characteristics of a typical EHS strategic plan (assuming that one even exists) are listed in Table 1. This rather grim, albeit realistic, assessment based on scores of plan reviews and input from dozens of EHS professionals, is in reality a glimmer of the enormous potential that exists if these plans were to be taken to their full potential. Clearly, business research indicates the power of strategy to drive business value and success. What if EHS departments used these same business techniques to their maximum advantage? The business research is in: strategies matter. They matter a lot in the competitive real world. Yet, EHS departments rarely take the time to take full advantage of this critical business element to define how they can add value to the business equation. EHS managers rush from meeting to meeting and respond to problem after problem. They never seem to have the time to really think and plan where all this effort is headed. Even worse, they may think that the strategic planning process is a waste of time relative to other, more pressing needs. What if EHS departments used these business techniques to their maximum advantage? In large part, this attitude may exist because EHS managers are unfamiliar with what is really involved in developing a plan that will influence business executives. Another project list of what will be done to maintain compliance and cuts costs seems to be all that can be mustered. This is not a strategic plan. It is not even remotely close to what it takes to prepare a real plan, nor does it have the potential to deliver anything significantly beyond that which has been delivered in the past. In today's competitive environment this is not adequate. So how do you go about developing a strategy and a plan that will matter to business executives and deliver value? It takes a lot more than a few EHS staff members sitting in a meeting for a day or two. It takes research, resources, time and courage. If readers are interested, I'll explore the details of this topic in a future Manager's Notebook. the Market," Harvard Business Review, July 2003, pg.79. Review Book, Boston, Mass., 1998, pg. 77. Assembled on a crash/tight schedule because of other "more pressing issues;" and surprise! Sits on the shelf, never to be looked at until the next cycle. This article originally appeared in the November/December 2003 issue Environmental Protection, Vol. 14, No.9.